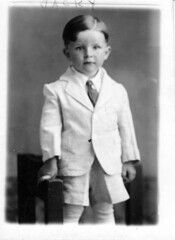 My dad, just under three years old. One of the things we retrieved from my dad’s house was the family photos. Initially I started sorting through the sets from the 90s (pics of me in my teens- ugh) and thought, nothing to see here. But as I dig deeper there are all sorts of historical photos, as well as written notes and stories. My dad was very good about labeling things (most of the time) and my grandma had the foresight to write down a few words and stories with some of the photos. It has been really interesting to sift through them, and in the process I decided that I need to document them and be a family historian of sorts. I’ve always liked taking photos and looking at these collections, I realized there was no way we could split them up between five siblings. 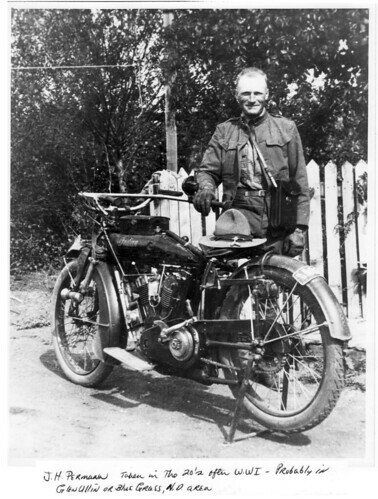 My paternal grandfather, with an Indian brand motorcycle, 1920s. So I started to scan them, only after my friend Flor volunteered to scan some too. (You can see her first post about them here. If you like old photographs, you might also enjoy this awesome blog, Dear Photograph). Knowing that she’s doing it just because she’s nice will (hopefully) keep me motivated to keep scanning, too. 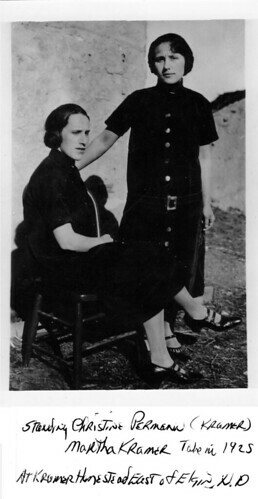 My paternal grandmother (standing) with her sister (I assume). So just in case you were wondering what I’ve been up to, there you go. It is stories like yours that makes me think that todays journey is tomorrow's history and we should be labelling just like your grandmother. What a wonderful find you have had. What a coincidence! We had Stan's mom's estate sale a week ago, and we came home with boxes of old photos that they were going to throw away! There are pictures of Stan's great-grandparents on both sides, and nobody else has copies! They are now safe with us. Our grandkids were fascinated with the photos of their great, great, great grandparents! Glad you saved them! Now I'm curious to find the same kind of stuff from my mom's side, if it exists.